This is Martha at about age 6. In spite of appearances, she was a happy child. Martha Freeman was born in Southern California in the days when dinosaurs were still a threat. At least that's what her three grown children will tell you. Ordinarily, Martha does not condone putting your shoes on the furniture. 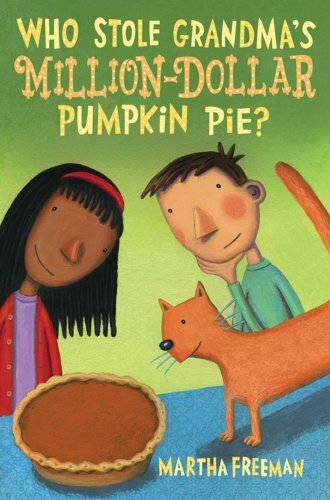 You can see how hosting many many Thanksgiving dinners for large groups affected her writing if you read her Thanksgivig mystery, Who Stole Grandma's Million-Dollar Pumpkin Pie?, which is part of the Chickadee Court series, featuring Alex, Yasmeen and Luau, the ace detective cat. Pets – especially cats – have always been important to Martha. That's why almost every single one of her books has a cat as a character, and her First Kids mysteries feature a first dog with too much energy, Hooligan.